Colors: It is buffy yellow in color with a light brown tail tinged with black. Typical adults are about 30 cm long. Weights vary greatly with time of year and with location: at emergence from hibernation the squirrels weigh between 200 and 400 grams, but by the time they hibernate again this may have risen to nearly 750 g. Males are slightly larger and heavier than females on average. They are dark brown on the upper side and tan underneath. The tail is shorter and less bushy than in other ground squirrels, and the external ears are so short as to look more like holes in the animal's head. 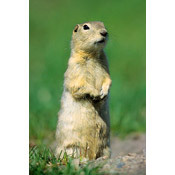 Behavior is more like that of a prairie dog than a typical ground squirrel. The tail is constantly trembling, so the animal is sometimes called the "flickertail". Richardson's ground squirrels appear to live communally, but they organize their social structure around female kinship. A female Richardson's ground squirrel will tolerate the presence of closely related females, but are territorial towards other individuals. 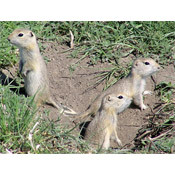 Individuals are territorial around their nest sites, the burrows of Richardson's ground squirrels are grouped closely together in colonies, and individuals give audible alarm calls when possible predators approach. Recent research has shown that in some cases, ultrasonic alarm calls are given, and are responded to by other members of the colony. Offspring genetically have calls that resemble those of their parents so the adults can pick up on their own offspring's call when danger threatens. 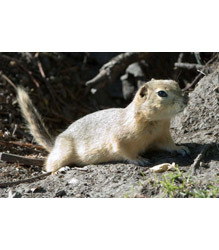 Female Richardson's ground squirrels produce one litter per year. The young, up to 8 in a litter, are born in April or May. Young ground squirrels remain underground in the burrow until they are approximately 30 days old.